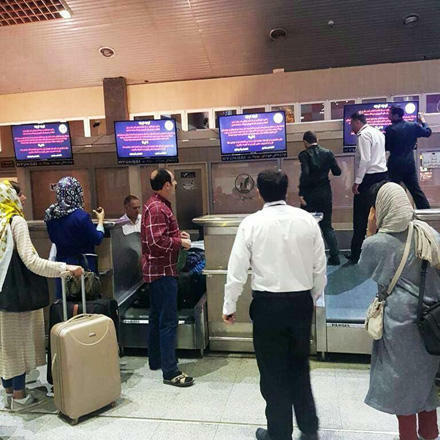 Hackers have taken control of monitors in Tabriz International Airport of Iran’s East Azerbaijan province on June 7, Iranian media outlets reported. The hackers posted massages in support of protests in Iran and strike of Iranian truck drivers. A group introducing itself as Tapandegan (Palpitaters) has taken the responsibility of the attack, saying will continue its attacks. Iran’s semi-official Fars news agency reported that the airport authorities have shut down the monitors and efforts are underway to settle the problem. The officials have refused to make comment regarding the issue. In a similar attack on May 24 evening, Tapandegan group took control of Mashhad airport’s electronic sign boards, posting a statement protesting against Iran’s military presence in the Middle East and expressing support for the people of Kazeroon, a city in Southern Fars Province, where people have been demonstrating against the government for months.